A 5 mile linear walk from Richmond Station - served by trains and tube (District line). Buses return to the station. 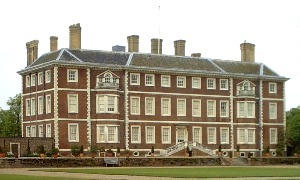 There is the opportunity to visit Ham House (check opening times) which is a National Trust property [website]. The Orangery houses a cafe or there are picnic facilities. Note: you are advised to check tide times as the riverside path can become flooded at high tides. The First Church of Christ Scientist was built in 1939-53. Vineyard Path on the left runs alongside an overflow to the churchyard. On the right are the attractive St James's Cottages. St Mary Magdalene is the parish church built in 1750 but with a 15th century tower and 20th century chancel. A guide is available inside. Continue along Red Lion Street. Cross and go down the cobbled Water Lane opposite. This is where goods would have been tranferred to/from river transport. This area is liable to flooding as can be seen at the White Cross Hotel (an 18th century inn). In Whittaker Avenue to the left the former Town Hall of 1893 serves as a Gallery & Museum. The riverside Heron Square development was designed by Quinlan Terry in 1988. It is mostly offices but incorporates Heron House and the former Tower Hotel. Beyond there are boathouses and workshops including the premises of Turks. This is now the oldest bridge spanning the river having been completed in 1777 to replace a ferry. Tolls were collected until 1859 and the bridge was widened in 1939. A riverside restaurant has one of London's Great Trees (a London Plane). The former Three Pigeons Tavern is now residental. Cross Petersham Road into Terrace Gardens. These were the grounds of two former houses, Buccleuch & Lansdowne and were opened in 1887. There is statue of 'Father Thames'. Make your way up through the gardens by any route to Richmond Hill. There is conservatory and a Fairtrade cafe. There are information boards with details of features which can be seen from this famous (and protected) viewpoint. Further along The Wick of 1775 was the former home of Sir John Mills and his family. Neighbouring Wick House was built in 1772 for Joshua Reynolds by William Chambers. This was damaged in the war and later served as a nurses' home for the Star & Garter Home. This institution for disabled ex-servicemen was designed by Sir Edwin Cooper and opened in 1924. It occupies the site of the Star & Garter Hotel. The Richmond Hill Hotel and Richmond Gate Hotel were formed from 18th century houses. The structure on the roundabout was erected as a fountain by the RSPCA in 1891 and features heraldic griffins. There is an entrance to Richmond Park at the second roundabout. From here take the footpath across Petersham Common parallel with Star & Garter Hill. At the road junction cross and go along Petersham Road southwards (signposted Ham House). There are some fine houses here including Reston Lodge, Rutland Lodge (1660), Montrose House and Petersham House (1680). St Peter's Church can be reached via Church Lane. The chancel is 13thc, the nave 16th and the tower 17th. The explorer George Vancouver is buried in the churchyard. Further along is the Fox & Duck pub with the old forge and an 18th century watchman's lock-up alongside. Bear left along Sudbrook Lane. Detour into Bute Avenue to view All Saints Church. This was built in 1901 for Mrs Warde by John Kelly on the site of Bute House. At the end of Sudbrook Lane is the entrance to Richmond Golf Club (private). The house, which now serves as a clubhouse, was designed by James Gibbs in 1726. Go right along Hazel Lane. Whornes Place was built in 1925 of materials from a timber framed house of 1487 from Kent. At the end go right along Petersham Road. Woodbine Cottage and Elm Lodge were both occupied by Charles Dickens, the latter whilst he wrote Nicholas Nickleby. Go through the 'Jacobean' Gatehouse (built 1900) on the left and continue along the path. This passes the German School which occupies Douglas House (1700) and Ham Polo Ground. On reaching a walled area (Ham House) follow the wall to the right. Go left at the end for views of or access to Ham House. This was built in 1610 but modified in the 1670s. It was the home of the Dysart family from 1637 until they gave it to the National Trust in 1948. Continue along the front of the property then go left at Ham Street. The Manor House is early 18th century. Beaufort House was the dower house to Ham House. Grey Court School includes Newman House, the childhood home of Cardinal Newman. The Tollemache Almshouses were built in 1892. St Thomas Aquinas RC Church was originally the village school. Hardwicke House was built in 1688. Orford Hall is now part of St Michael's Convent. There are Jacobean style lodges to Ham House. South Lodge was built in 1862-72 to provide a home for girls orphaned by the cholera outbreak of 1847-9. It has been converted to flats. Stafford Cottages (now one house) are thought to be as old as Ham House. Walk back across the common, keeping left of the pond. Continue southwards on the west side of the common. Endsleigh Lodge is c1800, Gordon House 18th century, Forbes House 1936 and Langham House 1709. The building which is now the Cassel Hospital was built in the early 19th century. Bus 65 returns to Richmond Station from Upper Ham Road. The Richmond Society has produced 4 trails; Town, Green, Palace & Hill. The old town hall houses the Museum of Richmond and the Riverside Gallery with a changing programme of exhibitions. Admission to both is free.